Broken hearts go to Sagada. And then there are places where you have your heart broken. (SPOT.ph) The little gaps in the thatched roof gave way to slivers of moonlight, and the foggy mist blended well with the strong aroma of coffee wafting in from the other tables. Every once in a while, the faint scent of strawberry desserts would pierce the cold air, warmed by the flickering candles on the tables. The walls are festooned with photographs from simpler times, press releases preserved in simple frames. For the well-travelled and the aware, it’s the usual flair of the typical “ethnic restaurant concept,” only that this place was doing it way before many others were, and the memories I have of the place are more than a few years old. There are those who say that new loves are found in Baler, and broken hearts go to Sagada. 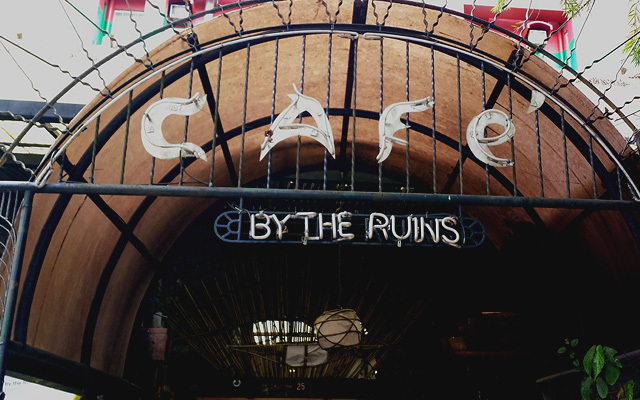 And then there are places where you have your heart broken: In the city I call home, it was Café by the Ruins. The typical Baguio piece is a case study in a very particular narrative: Names, places, the nitty-gritty of idle chit-chat usually made over strong coffee and breakfast rolls at 8:30 in the morning. At least, that’s what my elders used to do. There’s much reminiscence about “old Baguio” that more recent memories don’t seem to fit in. Yet when friends posted about Ruins being razed by a fire, and when friends from the Ruins family told me that the place won’t probably be rebuilt, it felt like a little piece of my heart was set on fire by the very embers of that charming place. 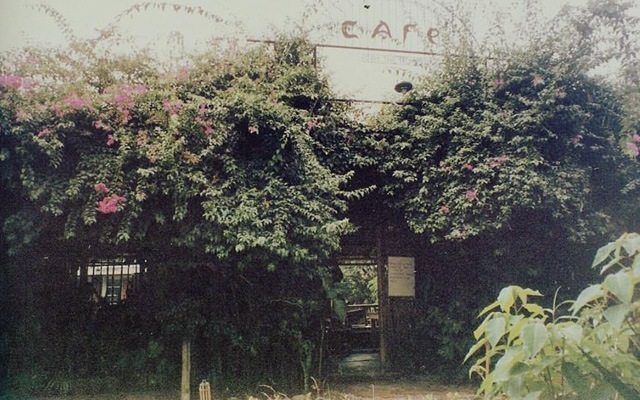 A photo of Café by the Ruins' partners back when it was still in its infancy. Baguio itself is a place that embodies heartbreak. Whenever I go home, it feels like seeing an old ex: There are the faint feelings that stir inside, reminding you of the many reasons why you fell in love. But by the time you open your eyes, the memories don’t really match up to the reality of it all. There are now mid-rise condos where old tree stumps and bamboo groves used to be. The roads have always been a little tight, but the traffic schemes look all too familiar. What used to be the sticks now host hypermarkets, hardware emporiums, and tourist traps. 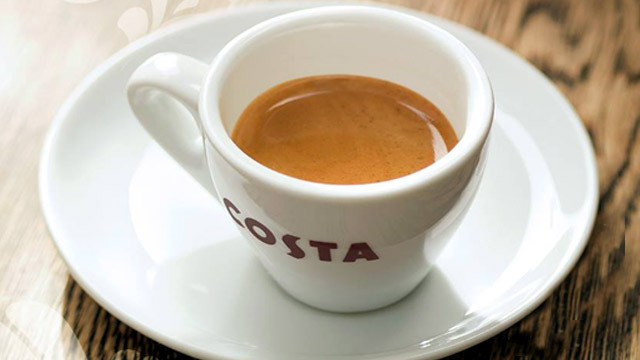 Over the past decade, many cafés and restaurants popped up in all corners of the city. 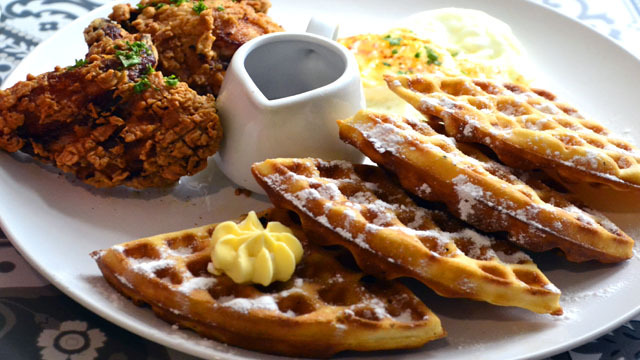 Each have their own flavors and styles to fit the discerning palates of locals and tourists alike. Still, a lot of them lack a certain local flavor: The “Baguio-ness” of them relegated to the Good Shepherd jam jars and the Romana Peanut Brittle cans sold near the counters. That’s just about it. 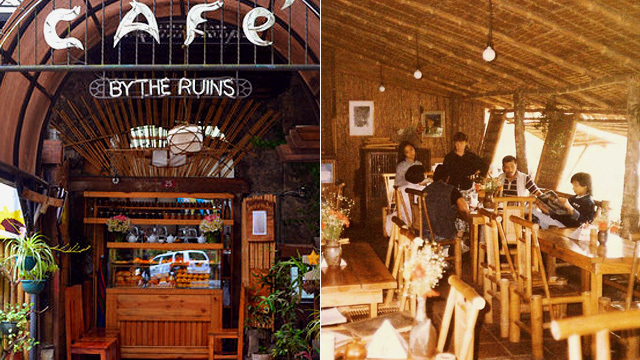 The new kids in town may have a lot of character—and a thousand-and-one ways to cook pizza and chicken tenders—but Café by the Ruins had history. The “Ruins” in Café by the Ruins may evoke thoughts that the restaurant was put up amidst the rubble of the 1990 killer earthquake: It wasn’t. The lot where Ruins stood used to be the Garden Theater, an outdoor cinema that was built in 1912 by Hubert Phelps Whitmarsh. The place was later converted into Whitmarsh’s residence, but was later destroyed by carpetbombing tactics in World War II. 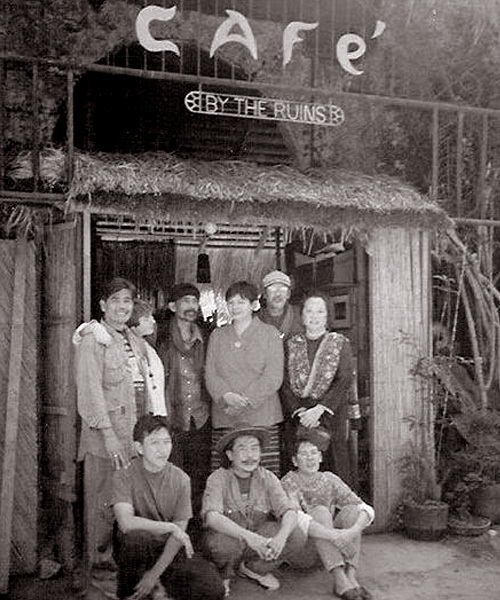 It was from these ruins that 12 Baguio artists—Adelaida Lim, Christine Arvisu, Roberto Villanueva, Baboo Mondoñedo, and Ben Cabrera, among others—built Café by the Ruins in 1988. If Luisa’s Café down by Session Road was the watering hole for Baguio journalists, Ruins was the place to be for artists and poets and performers. Ruins was home to music, visual art, and poetry that highlighted the creativity of locals, and attracted creative-minded folk from all corners of the Philippines. 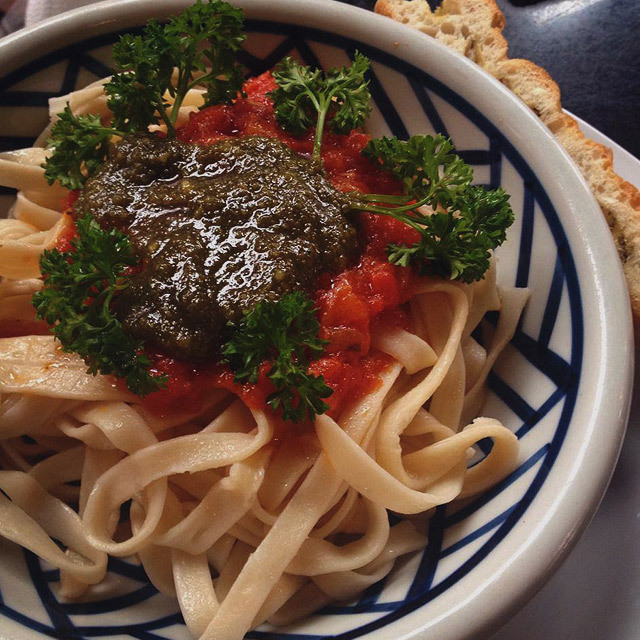 Classic Pasta with Pili Nut Pesto. Café by the Ruins served locally sourced and organic ingredients. The food, too, was unabashedly local: The menu changed many times a year not only to reflect the seasons, but to highlight the freshest and most affordable locally sourced produce and ingredients in the market. Ruins did “locally sourced” and “organic” before they became all-important lifestyle buzzwords in the new millennium. Ruins was never shy about bringing forward its artistic origins and character into its menu: A sandwich inspired by Nick Joaquin’s instructions, Villanueva’s take on arroz caldo (made with really sticky glutinous rice), and the original camote bread invented by Ernie Lim himself. The food was hearty and filling, reasonably priced, and was always served by courteous locals who made sure that the locals’ brand of service was as much a part of the locally sourced ingredients for the food. As a pillar of the community, Ruins was at the forefront not only of the art scene, but of outreach as well. Ruins became a soup kitchen when disaster struck Baguio: once in the 1990 killer earthquake, when bowls of soup and supplies were shared to people in need. Ruins once again extended a helping hand to Baguio folk in 2009, when Typhoon Pepeng struck. All the while, people kept coming back to Café by the Ruins, from intrepid tourists who have read so much about the place in the press, locals who believed in the enterprise, and creative folk who considered the place an extension of their homes. And then, all that burned down. People will have their own Ruins stories: The Hall of Justice employees who come down to the shop for a coffee during breaks, college students who have had their first romantic candlelit dinners here, artists who have shared their craft with an appreciative audience enjoying the best of local food. For me, this was the place where I made life-long friends over a summer semester: The coffees and salads shared over books and homework. This was the place where a politician would sometimes articulate a view of Baguio, to be turned over into an article for a local daily newspaper. This was the place where I tried to win an ex back a decade ago, with nothing more than tears welling in my eyes and a cliché-riddled poem read over the table. 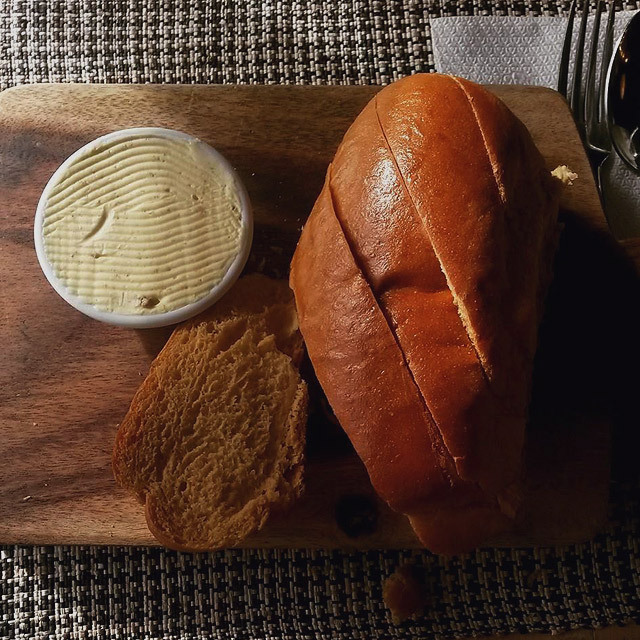 There’s something to be said about how a piece of Baguio was lost because Ruins as we know it is gone, but there will always be places out there that will try to capture that moment: Like how enterprising Baguio bakers try to copy its camote bread. But like every place that closed its doors over the years, there’s always that little bit of Baguio that breaks off into nostalgia. Like how the jungles on the hillsides have been replaced by yellow houses. Or how those old friendships from the summers at Ruins gave way to family and career. Or how those local politicians who held those kapihan sessions at Ruins probably still hold office. Or how exes become memories: Cherished for what they were, and seen for what they are. 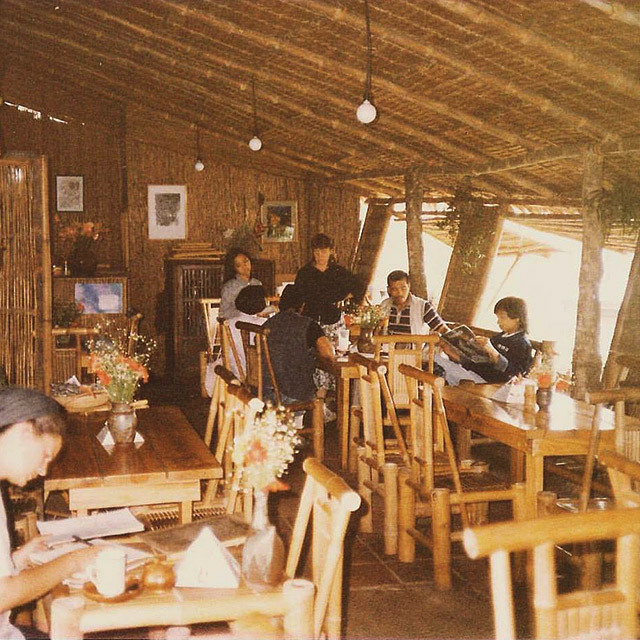 In a cañao commemorating the many anniversaries of Café by the Ruins, the elders spoke of the thatched roof going up and up, but never spoke of the place burning down. It was anything but the tired “ethnic restaurant concept,” but the local place that valued everything local. It was more than just a place where artists went, but a place where stories—like its food—were shared and exchanged. It was more than just a place which had wooden pillars that held its quaint roof up, but a pillar of a city whose changing identity is in need of one. Like Ruins itself, the memories are probably best left there: To be built on, one day, for other things and experiences. With thanks to Padma and Feliz Lim Perez for their thoughts and stories.